Here is a cast to die for, who play characters in a home for retired opera singers; they getting ready for their annual celebration of Verdi's birthday. But there is a "spanner (wrench) in the works" when a former diva arrives, in the person of Maggie Smith. Based on the play by Ronald Harwood and directed by first-timer Dustin Hoffman, this delicious PG-13 comedy bathes us in classical music, witty dialogue and a lovely setting. In fact the opening credits include some of the finest editing I've had the pleasure to enjoy in recent years. Kudos to Barney Pilling for the film editing; Ben Smith for the art direction; and Dustin Hoffman for respecting the music. The world of opera is a relatively small one, so it is no surprise that a few of these divas and divos have a shared "history," and therein lies our tale. * Maggie Smith ("Downton Abbey") is Jean, who always had at least 12 curtain calls but hasn't sung in far too long! 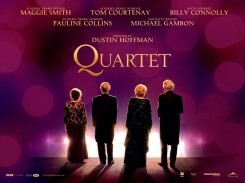 * Michael Gambon ("Harry Potter") is Cedric, in charge of the star-studded gala, with a towering ego of his own. * Billy Connolly ("Brave") is Wilf, proof positive that an old horn dog never quits sniffing around. * Tom Courtenay ("Gambit") is Reggie, a kind, considerate fellow who is still nursing a broken heart. * Pauline Collins ("You Will Meet a Tall Dark Stranger") is Cissy, the sweet busybody who can't think of one bad thing to say about anyone. Just a couple of important tips: 1) If you have any hearing problems, either see this in a theater that features closed captions, or wait for the DVD so you can turn on the subtitles. 2) Be sure to stay through the final credits because Mr Hoffman generously included the faces of many of the performers, along with a head shot of that same performer during his or her heyday. What a beautiful finale!